This guide will help you create a simple web application with Spring Boot. 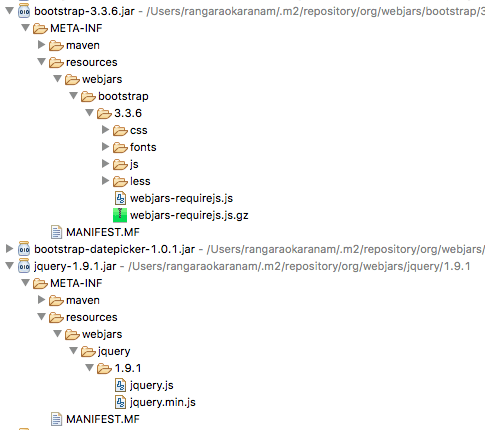 We will add the dependencies for Bootstrap and jQuery webjars. We will create a simple jsp view using jQuery and Bootstrap. How to bootstrap a simple project with Spring Initializr? How to initialize a basic web application for Spring Boot? How to add a JSP for web application? How to add webjars for jQuery and Bootstrap? How to create a simple view using jQuery and Bootstrap? We will build a static todo page (un-formatted) rendered using a jsp. Following screenshot shows eclipse project with all the files we would create. SpringBootWebApplicationBootstrapJqueryApplication.java - Spring Boot Application class. This initialized the Spring Boot application with auto configuration. WelcomeController.java - A Controller with a method to redirect to the view - jsp. welcome.jsp - The view - uses Jquery and Bootstrap. pom.xml - We will add the webjar dependencies for Bootstrap and jQuery to pom.xml. application.properties - This is typically used to configure frameworks in Spring Boot. In this example, we would configure our view resolver in application.properties. Creating a Web application with Spring Initializr is a cake walk. If you want to understand all the files that are part of this project, you can go here. Spring Boot Starter Web provides all the dependencies and the auto configuration need to develop web applications. It is the first dependency we would use. We want to use JSP as the view. Default embedded servlet container for Spring Boot Starter Web is tomcat. To enable support for JSP’s, we would need to add a dependency on tomcat-embed-jasper. We would have our jsp’s in /WEB-INF/jsp/. We would need to configure the view resolver with the prefix and suffix. Lets add in a simple controller redirecting to the view. Let’s create a simple with a basic HTML structure. We will create a basic table which we would want to format a little later. Make sure that you restart the application and we are ready to use jquery and bootstrap in our project. If you expand your dependencies you should see the dependencies. Update view using jQuery and Bootstrap is shown below. Spring Boot would auto configure the webjars resource mapping. So you DON’T need to do this anymore.